I bought this as a gift for a good friend, and I can’t apologize enough to her. This puzzle is a fun vacuum. Many, many of its pieces are so close in shape to others that it has numerous “false friends” or connections that seem right and need to be undone when other parts come together. Thus, much of this puzzle is done by tedious trial and error. 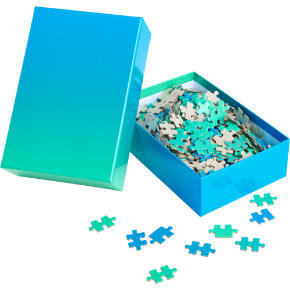 This is not only NOT fun, but also problematic because the puzzle is not sturdy enough to withstand the necessary attempts to fit the pieces together, and many of the coatings on the connector nubs separated from the cardboard, so the end result is a puzzle with many sticky-up-py flaps. This present would be a great gift for someone you DIDN’T like, as it would send them into a spiral of frustration, and make them question their self-worth that they can’t complete a simple 500-pc. puzzle. This puzzle would be lovely if it had better shape differentiation in its pieces, and was better made to withstand more than one connection attempt. As is, it is a very expensive pretty box that, like Pandora’s, only brings pain and suffering when opened. Interestingly, I got a confirmation when I submitted the review, and another that said it was live and gave me a link. But when I clicked the link, it went to the general site, as happened when I clicked the link for customer service. Badly done, CB2. When I searched the site for the puzzle, both the item and the reviews (the other review besides mine was also one star) were gone. Did they remove it because it sold out, because they don’t wish to offer a shoddy product, or because the reviews were so damning? I don’t know. But it’s gone and I still had some spleen to vent about it. Thus, I am posting it here for my fellow puzzle geeks to be warned in case it’s still out in the world: pretty box but bad puzzle. This entry was posted on Thursday, January 21st, 2016 at 9:29 am	and is filed under Weird Things That Bother Me. You can follow any responses to this entry through the RSS 2.0 feed. Both comments and pings are currently closed. I don’t solve puzzles, but I really enjoyed reading your review.